#1: The "I attended that university" farce. Applicants may list a degree when they only attended classes at a university or college, or may not have ever stepped foot on the campus. Don't fall for it by: Order an education verification on any claims your applicant makes on attendance, degree obtained, or special certification. #2: The "I worked there 5 years" hoax. A staggering third of all resumes are estimated to contain some sort of fraudulent dates of employment. This can range from stretching employment dates to cover job gaps (or something more sinister like jail time), to claiming they were "self employed" for a certain time frame. Some applicants will even create jobs to cover gaps in employment. Don't fall for it by: Verify all dates of employment with the employer, and look closely and ask about any gaps. #3: The "these people think I'm awesome" shenanigan. A good portion (estimated at 27%) of all resumes contains a false reference. Applicants may lie about this because they had poor performance at their previous job, or may have fabricated their entire work history. The potential hire may submit incorrect or incomplete reference information in hopes you won't take the time to "track down" the reference. The resume may also contain fraudulent information that directs employers to friends or family members-claiming they are managers or co-workers-that report in glowing terms on the applicant. Don't fall for it by: Use a professional background screening company to follow up with references and ask specific questions pertaining to the applicant's performance and pay. 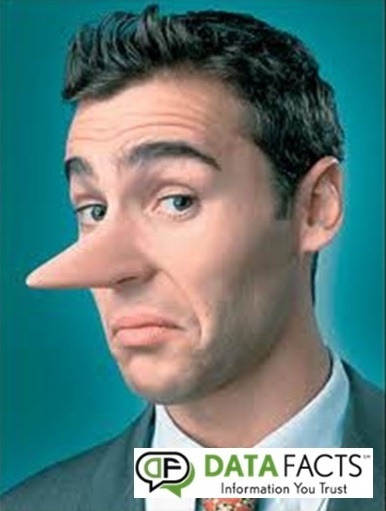 REMEMBER: the consequences of being duped by a resume lie are high. An employee that is a bad fit can also cost a company customers, inventory costs, and even litigation expenses. Verify all information on an applicant's resume and application before reaching a hiring decision. A professional background screening company can help you have a clearer picture of the job seeker so you won't be a victim of a costly mistake. Have a Happy April Fool's Day!